CRASH SCENE: Hollis Avenue in Arima had to be cordoned off for several minutes yesterday after a rotting utility pole fell on this car. 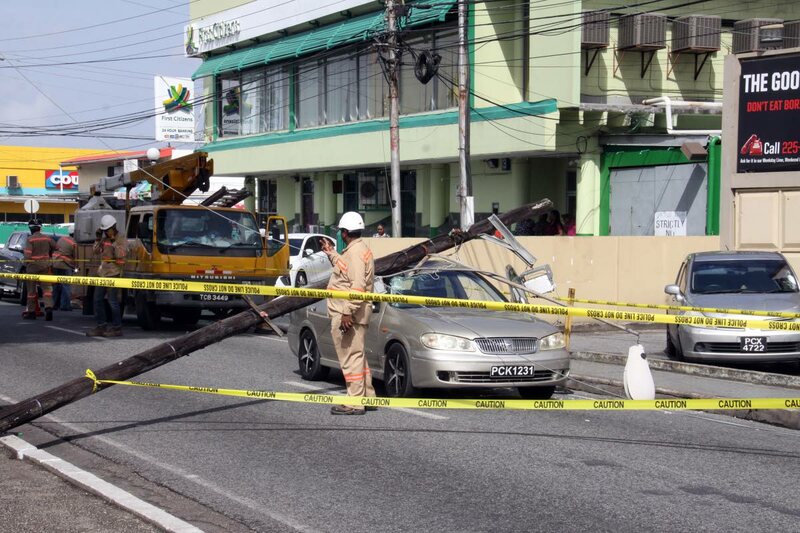 AN Arima man escaped serious injury and even death when a rotten wooden utility pole fell on his car while he was driving along Morris Avenue in Arima. The injured man was trapped in his beige Nissan Almera for a few minutes before being rescued by other drivers. He was taken to the Arima hospital and treated for minor injuries. Police said the man appeared dazed after the incident and is yet to be interviewed. According to reports, at about 9.15 am a PTSC bus was driving along Robinson Circular when it became entangled with a low-hanging line, resulting in the pole crashing down on the car. Arima Borough Corporation staff helped remove the injured man’s car, while the pole was put at the side of the road to ensure a free flow of traffic. Yesterday, Arima Mayor Lisa Morris-Julien said the accident could have been avoided if TSTT had been attending council meetings where information is shared about rotten poles in the eastern borough. She said TSTT personnel had not been going to council meetings for quite a while, but feels if they had continued with their drive to remove such poles, the accident might not have happened. The mayor said she will be writing a formal complain to the chairman of TSTT and also speaking with Public Utilities Minister Robert Le Hunte. “I know my very efficient Minister of Public Utilities will get involved and the issue of rotting poles will be taken care of,” Morris-Julien said. Reply to "Rotten utility pole falls on car"